Empowerment is something desired by all who feel oppressed. If there is an overpowering force that is out to do us harm, we wish more than anything to overcome it. Contemporary common sense however teaches that there is one compelling force that we simply cannot overcome, and that is our own self (nafs). Desires, proclivities, and inclinations toward unwholesome, unseemly things are seen to be, at most, unfortunate. With mottos like “Just Do It!” having become part of the cultural fabric of contemporary society, it is easy to see why even those who wish to stop loving something ugly view the task as requiring Herculean effort. In the midst of such a depressing fatalism of the self, the empowering teachings of the Qur’an and Prophetic sunnah are reason for the believer to rejoice. No doubt, it is not an easy job to curb one’s love for negative things, be it for an old flame post-marriage or for a sorry addiction. But it can be done, and our religion offers us a practical and spiritually potent plan for how to do so. Using Qur’anic passages in a meaningful and motivating way, the following excerpt from Love in the Holy Qur’an offers three key practices for how we can train our hearts to stop loving what is not good for itself.1 The Qur’anic verses cited deserve special attention, as they have a power all their own and an ability to soften hearts and inspire right action. In a sense, the whole spiritual and moral life is about controlling what one loves and what one does not love, and so this question can be tremendously complex. Nevertheless, in the Holy Qur’an God speaks of particular keys that show how to more easily strengthen and weaken love as such. Thus internal change is hard, but not impossible. It requires a priori some faith in God (who reckon that they shall meet their Lord), hope in Him and fear of Him (and that to Him they are returning). But in addition to faith, hope and fear … internal change then has need of three key virtues or practices, namely: (1) patience; (2) humility; (3) prayer and remembrance of God. Thus if a person’s soul—with all its constituent parts and faculties—indulges in, and becomes attached to, a ‘negative’ object of love, then (if they truly wish to stop that harmful love) they must stop letting themselves indulge in it, and a fortiori stop thinking about it. 1The three key practices outlined in the excerpt have a deep power to affect change. One should have hope that the change they desire within themselves can and will happen, since our Beloved Prophet ﷺ told us: “For every ailment, God has sent down its cure.” Loving something ugly is a spiritual ailment, and its medicine is available for us in this earthly realm. At the same time, someone may feel so overwhelmed that they cannot see how to proceed, even despite their practice of the three keys mentioned in this excerpt. If that is the case, one should remember that Allah Most High also tells us in the Qur’an, “Ask those who know well if you know not” (16:43). One may need to resort to seeking the aid of a spiritual guide or an addiction counselor, and this too is part of one’s journey to Allah. 2Reprinted with permission. 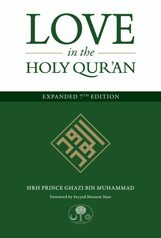 Bin Muhammad, HRH Prince Ghazi, Love in the Holy Qur’an, expanded 7th edition. Cambridge, Islamic Texts Society, 2013, p. 208-12.